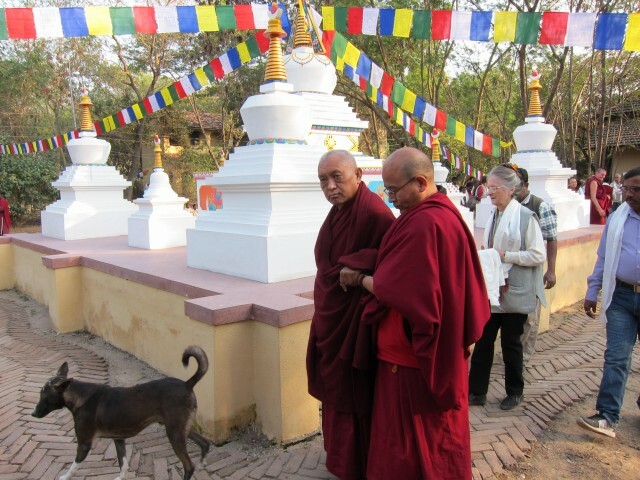 Lama Zopa Rinpoche with Ven.Khedup and behind Maitri Charitable Trust Director Adriana Ferranti and her staff circumambulating the stupas made so that animals can create merit while they receive care. The Animal Liberation Fund was pleased to offer US$3,000 to MAITRI Charitable Trust, which, through its Animal Care Program, has taken on the responsibility for providing essential care to hundreds of animals in need in Bodhgaya, India, since 1994. This donation was specifically intended to cover the cost of food for 45 goats and 25 chickens that have been saved from death. The annual cost to feed these animals is US$7,117. The Animal Liberation Fund is extremely happy to support MAITRI Charitable Trust in its incredible efforts caring for animals that would otherwise be killed. You can learn more about what MAITRI Charitable Trust is doing and support their work directly. Please rejoice in this work. You are welcome to support the Animal Liberation Fund, which supports weekly animal liberations and offers support to other projects dedicated to liberating animals such as MAITRI Charitable Trust.